Amy's team won the mileage race this week. I got some more bling in the mail today. My Desert Star for completeing the half marathon and the marathon in back to back years at the PF Chang's Rock and Roll Marathon here in Arizona. Mile 1286, Chandler, AZ - I've been waiting all year for this to open up. 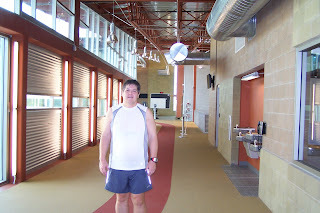 Chandler's first recreation center in Tumbleweed Park. It free until the grand opening sometime in April. I did a write up about it on my real estate blog, if you want to see more pictures. It wasn't crowded, maybe a dozen people lifting weights. I started by doing 20 laps on the track. The track is nice soft and 1/10 of a mile long. It goes past the weights, basketball courts below, around the outside courtyard and back to were the weights and cardio machines are. I was the only one running on it. After 2 miles I played around on the Lifestyle resistance machines and did some rowing. Then I did one more mile on the track to give me 3 miles for the day. Mile 1283, Chandler, AZ - 3.47 miles in 41:25. It was a perfect night for a run. Lots of neighbors BBQing, so I thought about food alot. I ran more tonight than yesterday. About 80% of the distance. Knee feels fine. Time to ice it and use the stick. Mile 1280, Chandler, AZ- I got in 5.62 miles yesterday in perfect weather. It was around 60 degrees with blue skies. I ran on the canal on the north east side of Chandler. The canal bank was a bit muddy and the service trucks left lots of trails. I really didn't want the outing to end. But, I knew that when I got back to the truck, it would be over. So, I did the unthinkable. I walked a lot of it. Normally, I would walk about 5-10%, but yesterday I walked about 40%. The second half of the run I was doing about 1-2 minutes of fast running. Normally, I go around a 10:30 -12 minute pace. I was in the 7's and 8's and I would try to hold it for as long as I could. Kind of like wind sprints. I was winded for sure. Near downtown Mesa near the train tracks I found this mural. It's on the side of a large barn/warehouse. This is just half of it. Those are cows parachuting down to earth. Great week 2 everyone. We are now approaching the Old Pueblo, Tucson. Home of the University of Arizona and Suguaro National Park. It's a beautiful area with lots of great places to hike and run. Everyone on Amy's Team got into double digits with Robbie leading the way with 28 miles. Many of you are dealing with that last winter storm, so keep up the good work. Warmer weather will be with you soon. Pat's team had a strong week too. Not as strong as week one, but some of us are still recovering from the Rock N' Roll Marathons. Katie out in Baltimore lead the way with 37.8 miles. I will try to post updates on Tuesday or Wednesday of each week. This week was really hectic, hence the delay. and the doctor said. . .
Mile 1274, Chandler, AZ-So I woke up this morning and headed over to the doctors. I thought it was an emergency, but they made me use a different entrance. My doctor is gone, so I got a new doctor. Dr. Cool. NO, that's her real name. Honest. Anyway, the nurse took my blood pressure and said, "Is your BP always this low?". Turns out it was 100/80 and yeah, it's always that low after she checked my chart. Then Dr. Cool entered. I told her about my marathon and my now bloated knee. I was expecting her to pull out the needle and drain the sucker. She felt my knee and basically called me a wimp. Her exact words were something like, "it's just over use and some ice will solve the problem. Have you been icing it?" The doc also looked at my blood tests and said I could stop taking statins for my cholestorol. So, all in all, a good doctors visit. Isn't that cool? So, I guess it's time to stop being a wimp and start to chisel my body. I got in 2.6 miles tonight in just over 30 minutes. I felt great. Ran 95% of the time at a nice steady pace. It's good to be back running. I started playing baseball in 1971. I was the kid picked last. A walk was a victory when I came to bat But, I loved the game. I slowly got better, but never good enough to play in high school. I switched to softball and have played off and on my entire adult life. Slowly I got better, but I have never hit a home run over a fence. Tonight I turned on an inside pitch, launching it down the left field line. The umpire, catcher and I stood at home plate and watched it twist towards the foul pole. I listened for the metal clank you hear when ball hits fence for a near home run. The sound never came. The ball bounced once and was found on the grassy hill over the left field fence. My first 'over the fence' home run. After the game, the ump gave me the ball. I think I have an injury from it. You can play it free on yahoo games. The object is to use your arrow keys to keep the balloon from hitting the walls and to direct it to the box. You have to speed touch the arrow keys and I did it while I listened to the tv. My arm now hurts. I always thought that repetitive use of your hands like that would hurt your eye sight. On the injury front, my knee feels good today. No swelling. No knee pain. Went to the track tonight and got 3.3 miles in. Walked .9 miles with the lovely wife earlier today. Mile 1268, Chandler, AZ - My first run since this month and I was sweating drops of jupiter. Can you name the band on that song? Hint - the lead singer has the same name as me. I just wanted to test the knee. 3 slow miles to Desert Breeze Lake and back. It turned into 3.45 miles in 42 minutes. About 1/3 of a mile in I noticed my left leg and foot felt way more tired than the right side. At around 2 miles I felt a slight needle type pain behind my knee. I think I was just noticing anything that could possible go wrong. Sort of like when you hear noises at night. The real test is to see if my knee swells up tonight. If not, I'll probably do another 3 miler tomorrow and take it real slow. Answer - Don't click on this if you don't want to know yet. Wouldn't it be great if blogger remembered names, places and words that you previously linked to and would give you a drop down box to link to them again. I can't be the first one to think of this. Does anyone know a solution? Here's our team stats. 209.7 team miles. The leader is Eric with 56.3 unbelievable miles. Way to go. Jeff, Cheryl, Karen, Lisa and Katie R. all posted plus 20 mile weeks. Follow all the teams at the Walk Across Arizona Leaderboard. Injury Report: My knee swelling has gone down considerably. Hopefully, I will get a run in this afternoon. It won't be long, but it will be needed. Week One is in the books. Here's the results for BlogWalkRun-Amy's Team. Taryn's miles are still to be added. Katie B & Robbie put up great numbers. Pat's Team's results are not in yet. We still owe $10, before we can update our miles. As soon as, I get that done I will post week one. Four members of that team are over 20 miles for the week. Want another challenge? This is the President's Fitness Challenge. You did it in elementary school and now there's an adult version with bling! Bronze, Silver and Gold medals. The miles you do, will count toward both challenges. I'm doing it. No running today. I spent the day doing a bit of real estate. Had to look at three homes for a client. Then I watched the FBR Open on TV. It was a great finish, as my man Phil Mickelson lost in sudden death. Finally, I watched the Super Bowl. They showed a blimp view of the stadium real early in the broadcast. It was dark, the lights were shinning, the ferris wheel was going. But, at my house 30 miles away it was still daylight. That just shows you the NFL can do amazing things. Another amazing thing is the new 'Big League Dreams' in Gilbert, AZ. It is paradise for the adult softball player. My left knee is full of fluid. Not sure why. It doesn't hurt much, but I can't bend it over 90 degrees either. I played softball on it tonight and got a pinch runner each time I got on base. Some occasional pain behind the knee. It feels weak. I'm going to rest it over the weekend. No long run with the TRC. If it's still swollen on Monday, it'll be time to go visit the doctor. Now for the good news. Ice-T is now my neighbor. Well, not next door neighbor. Well, not in the same square mile. But, same city. 4.34 miles away. Honest. OK, maybe he lives closer to J-mom and K-pokey. But, he lives in a Shea Laguna model, I live in a Shea Newport model. We're practically best buddies. I hope his knee is ok.
Hey, Ice do you want to go for a run when my knee is better?